﻿ Mr. John Abraham - A True "Youth Icon"
As a top model and rising movie star, John Abraham is not only a youth icon, but also a strict vegetarian and member of PETA (People for the Ethical Treatment of Animals). In addition, he devotes much of his time and energy to building houses for the less fortunate in India in collaboration with Habitat for Humanity. He also established an organization called "John's Brigade" to inspire youth to join him in his heroic efforts. 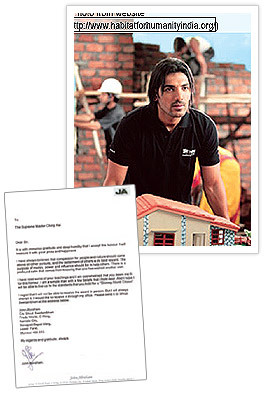 In Golden Year 4 (2007), the group built 5,000 houses in impoverished villages all over India and aim to build 8,000 more in 2008. 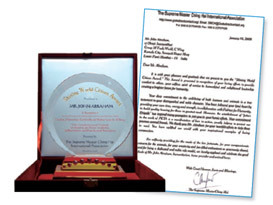 In recognition of his selfless endeavors to provide shelter to others and of his compassion for animals, Supreme Master Ching Hai bestowed the Shining World Citizen Award on Mr. Abraham. In accepting the Award, Mr. Abraham wrote to Master saying, "It is with immense gratitude and deep humility that I accept this honor. I will treasure it with great pride and happiness… I have always believed that compassion for people and nature should come above all other pursuits, and the betterment of others is its best reward. The purpose of money, power and influence should be to help others. There is a profound calm that comes from knowing that one has wished another well." He also added, "I have read some of your teachings and I am overwhelmed that you deem me fit for this honor. I am a simple man with a few beliefs that I hold dear. And I hope I will be able to live up to the standards that you hold for a 'Shining World Citizen.'" Thank you, Mr. John Abraham, for all your humanitarian efforts and love for animals. You are a true role model for us all and more than fit to be called a Shining World Citizen!